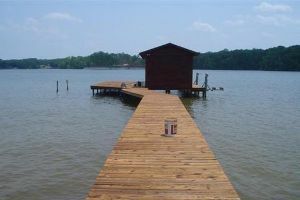 Being a North Carolina homeowner with property that houses a dock, means taking extra measures to care for it. The better care you invest, the better return that you get. Addressing the need for servicing your dock will help you to get the peak performance and optimal longevity that you want, need and deserve. Wood that is exposed to the elements the way that docks are cannot manage to last too long, at least not without proper care. Even with ongoing maintenance, at some point it will need wood restoration or replacement. However, learning about care and maintenance is an ideal way to prolong the need for any serious work. In the winter ice is very damaging to wood because it causes expansion, then melt, and the cycle continues. This pressure can really harm any wood that is submerged in water. Floating docks are not effected as much, but should still be cared for. If possible removing a floating dock during cold weather will certainly help to prolong the life expectancy. If your area tends to buildup a fair amount of ice, it would be a good idea to install de-icers. These devices are used to help reduce the likelihood of ice buildup. However, when the weather turns warm again, it is time to call in a professional to help you take care of cleaning and restoration. Here at Taskmasters Wood Maintenance, we provide the finest in quality workmanship for dock and deck cleaning and restoration. Taskmasters Wood Maintenance is the only name that you need to know, when it comes to all types of wood related maintenance. We take great pride in being able to help home and business owners maintain and salvage their wood features. Let us help you retain functionality and beauty in your wood elements. If you are looking for a reliable company you can count on for superior dock cleaning and deck restoration in North Carolina, South Carolina or Virginia, please call 252-266-9457 or complete our online request form.